You may not have wads of cash to spend on marketing in the early stages of your startup, but that doesn't mean that there aren't effective ways to get your brand out there. Before the Internet, small businesses only had a few ways to market their products cheaply, through methods like printing out fliers or sponsoring little local events. Now there are all kinds of opportunities out there on the Web—you just need to know where to look. Registering your business with Google Places allows it to be found more easily on Google searches and it shows up on Google Maps. All you have to do is fill out the form and register, then get your business verified through their confirmation process, which can be done either with a phone call or snail mail. Yahoo! also has a big database of businesses called Yahoo! Local. It's free, and is certainly worth the few minutes it takes to set up. Microsoft's Bing has a similar service that's easy to sign up for. Social media isn't just a tool to gain exposure—it has now become a necessary time investment for every business to make. You can tie in ads and offers on your Facebook page and have a direct channel with your customers on Twitter. Networking on LinkedIn—both at the personal and company level—can be another way to help your startup. YouTube provides a free way to distribute creative promotional videos, but in order to succeed you must put up content that people want to view and are relevant to your business—a simple ad will not work. A Flickr profile can also help by giving you one place to compile all the photos for your business, and allows you to link back to your website. Search engine optimization cannot be underestimated in the world of constant Googling. Pick up a book or head over to an online how-to-guide on SEO and make sure your site is primed for performance on search engines. Every time your business does something newsworthy, don't hesitate to shoot off a press release—maybe folks will pick up on it. They're a powerful media tool to use to help generate publicity, and having free distribution of them is a bonus. There are dozens of websites out there that you can use for your press releases, such as PRLog and 24/7 Press Release. Every niche has communities online that you can get involved in. But just signing up for a forum and posting every once in a while about your business isn't beneficial for anyone, and will likely just annoy people. Actively contribute and build a rapport with the community, while keeping your business out of it. Passively promote your business by putting a link in your signature or mentioning it only when the context is appropriate. Have your own network of trusted providers (doctors, plumbers, electricians and more) at your finger tips. Find providers recommended by your family and friends. Create and exchange smart business cards to promote yourself or your business. Grow your business by getting visibility among your customer s social connections. Advertise special offers that reach customers directly for free. Get real rewards for using the app. Publish special offers or deals on Facebook. One tap easy exchange of smart business cards. 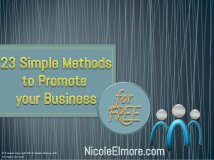 Promote your business for FREE!!! @Imps Premier Plus: Our next Imps Premier Plus meeting is on 13th April, it's free and it's a great chance to promote your business. Get in touch for more info!